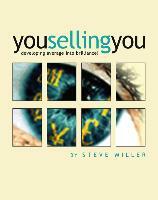 You Selling You is a programme that provides a thorough yet practical insight into the tools needed to sell yourself. It explains and shows you how to use techniques that can be used for many real life situations including:- . job interviews . sales meetings . delivering presentations . building relationships with new people . promoting yourself as one of the best ..and many other areas of both personal and professional life where you need to be selling yourself! In short if you want to influence or inspire other people this book is for you.